YOUNG HARRIS, Ga. – Towns County first responders met with Commissioner Cliff Bradshaw and Chamber of Commerce President Candace Lee on Friday to put plans in place for the upcoming Bassmaster Angler of the Year tournament, set to kick off Thursday, Sept. 20. According to the Towns County Chamber, the event is bound to draw between 15,000 – 18,000 visitors to the area. Participants and spectators are expected to begin arriving days prior to the official start of the tournament, with weekend traffic anticipated to become sporadically congested in Hiawassee at times. First responders intend to reduce incoming Georgia Mountain Fairground traffic to a single turning lane during peak hours. While no specific instructions were issued to the public, emergency crews ask motorists to use caution while traveling due to the population influx. The actual number of visitors may fluctuate, depending on the weather forecast. Fifty fishermen will vye for the coveted title of Bassmaster Angler of the Year. Fishing competitors are scheduled to launch onto Lake Chatuge at 7 a.m. on Thursday, with daily weigh-ins at the Georgia Mountain Fairgrounds at 3:45 p.m. The tournament runs through Sunday, Sept. 23. Saturday is an “off” day with no competition scheduled. 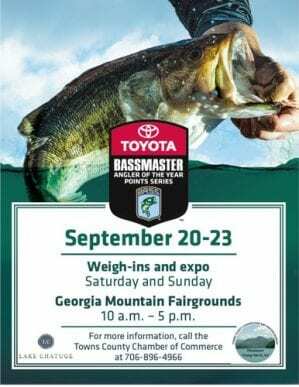 Bassmaster Elite Series Outdoor Expo and Bassmaster University will take place at the Georgia Mountain Fairgrounds on Saturday, Sept. 22, and Sunday, Sept, 23, beginning at 10 a.m. Saturday, and 11 a.m. Sunday. Public launch viewing is available during the competition days – Thursday, Friday, and Sunday – at 7 a.m. from the Georgia Mountain Fairgrounds at 1311 Music Hall Rd. in Hiawassee. The boat ramps will be closed to the public from 8 p.m. on Wednesday, Sept. 19, through Sunday, Sept. 23 until 3 p.m.